Yesterday afternoon G. Scott Owen and myself gave presentations to the students and faculty at Shanghai Normal University. The talk was attended by a group of students as well as various Deans and Chairs of the univeristy such as Wan Qinghua and Lu Jianfei. We were inducted into the 2009 International Scholars Forum and presented with chops containing the Chinses characters for our names. Afterwards we went out with the faculty of the univerisy and publishers of Fantasy Art Magazine, Mr. Wang Wei and Ms. Ying Zhang for a wonderful dinner. 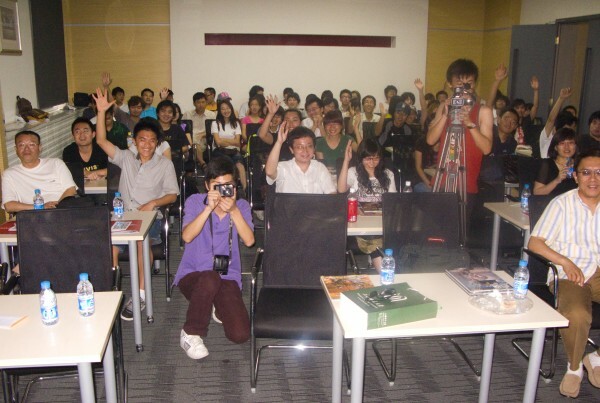 Mr. Wang is an amazing artist in his own right and helps run an animation seminar for Chinese youth called the Asian Youth Animation and Comics Contest or AYACC.